Need more information about booking Home 179798 ? La Vieille Ferme - The Old Farm - is a 19th century working farm that has been beautifully converted and renovated to 5 rustic gites (cottages). 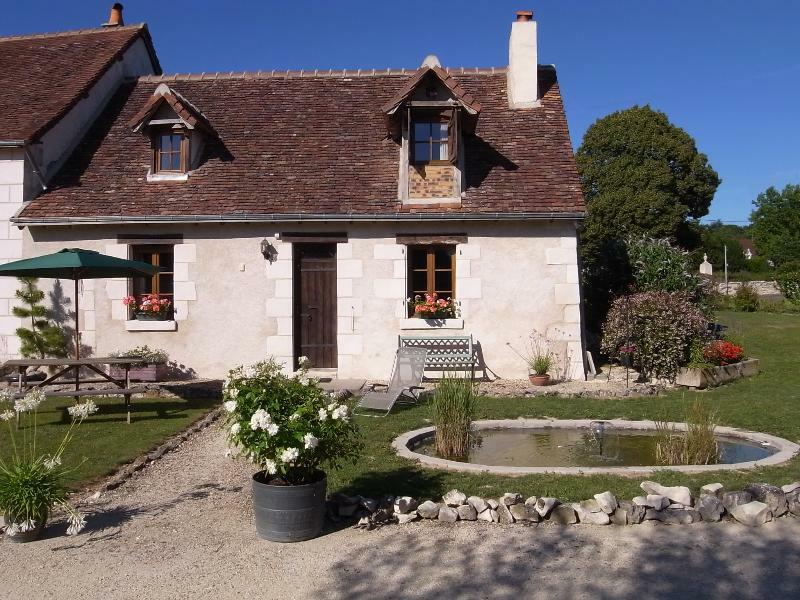 The gites are accompanied by spacious grounds with a large open barn, lovely gardens, private parking and a superb heated, covered swimming pool. The gites are all well furnished with English/French TV, WiFi, HiFi, fully equipped kitchen including dishwasher, fresh linen and bath towels on arrival and traditional log burning fires for cosy evenings with wine and cheese! The swimming pool is heated and covered making it suitable for all weathers and seasons. The versatile cover gives the best of all worlds as it can be retracted along the sides to reveal the countryside views and give an open air feel in the summer. The pool has a child safe gate at all times and the bottom surround panels can be kept in place whilst higher panels are opened to keep a safe barrier for young children if needed. There is a jet stream in the pool to ‘swim against the tide’! Bellebouche is a freshwater lake with 900m sandy beach, around 30 mins drive away. Suitable for swimming and windsurfing with Kayaks and pedalos also for hire. There are nature paths through pine woods for cycling and walking, mini golf, picnic areas, snack bar and restaurant. La Rochelle is the nearest beach town around 2hrs 50mins away. It is located on Atlantic coast with its old harbour, which is lined with seafood restaurants, pleasure boat marina, aquarium and botanical gardens. This Cottage has 3 bedrooms, 2 bathrooms and sleeps 5. It’s been listed on Holiday Lettings since 21 Sep 2011. Located in Indre-et-Loire, it has 29 reviews with an overall rating of 5. The average weekly rate varies from £567 to £1254. The Owner has a response rate of 100% and the property’s calendar was last updated on 21 Apr 2019. We stayed in the Farmhouse at this very peaceful location. Great to wake up in the morning and hear the birds but no traffic, unlike at home. Just a short stroll up the road to collect croissants and bread for breakfast. We hired bikes from owners Angela and Derek on a couple of days and explored the countryside and nearby villages on the very quiet roads. What a great place to live! Drove to a couple of chateaux and were surprised how few people were around. Our gite was very well equipped and incredibly clean and tidy on our arrival. We had our own garden and had a couple of BBQs during warm evenings. Made good use of the swimming pool which was lovely and warm. Must go back one day! We stayed in The Farmhouse which was spotlessly clean when we arrived. The grounds are very pretty with a lovely indoor swimming pool in the garden room – and it is a very large room! This was great as we had a couple of cooler, cloudy days but it meant we were warm inside and the water felt really warm too. When the sun came out the windows and doors could be opened and we made good use of the sun terrace. Had a couple of BBQ’s in our garden and have happy memories of eating dinner outside, enjoying a bottle of local wine. There is plenty to see and do in the area and we visited several chateaux, all within easy driving distance – very little traffic on the roads so it was a pleasure to drive. Some lovely little villages around to explore and we found some good restaurants, including the local one in easy walking distance. Hired some bikes one day from the friendly and helpful owners, Angela and Derek, and felt very safe on the quiet roads. All in all a great place for a relaxing holiday away from the hustle and bustle of our normal everyday lives. You can get in touch with Nick (the owner) through the contact form on this page. Send Nick (the owner) an email through the contact form on this page. Alternatively, if there’s a phone number on this page, you can call them. How do I contact Nick (the owner)? If you’ve already booked, go to Manage your holiday booking to view Nick the owner's contact details or send them a message. Or send Nick (the owner) an enquiry through the Contact the owner/manager form if you’d like a quote or more info first. When you pay online through the Book your stay form, a booking request is sent to Nick (the owner). You’ll find out within 24 hours whether they’ve accepted - no money will leave your account before then. You can also request a quote from Nick (the owner) through the contact form. The owner will email you the total cost for your dates and a link to book and pay online. Use the Book your stay form to pay provisionally online. You can pay by credit/debit card or PayPal. Nick (the owner) will have 24 hours to accept the booking and no money will leave your account before then. Why can't I call Nick (the owner) before booking? You’ll need to contact Nick (the owner) to do this. Send them a message in Manage your holiday booking or through the contact form on this page. You can request to change the dates or number of people on your booking via the Manage your holiday booking page. To change your holiday dates use the Edit booking button. If you need to change the number of guests staying then send Nick (the owner) a message. If Nick (the owner) agrees, they’ll send you a revised quote outlining the changes. You can review and accept/decline this from the Manage your holiday booking page. You’ll have 48 hours to take action before the revised quote expires.